Scroll through here or visit the Full Programme page to get details of all venues and artists including sample images and links to even more information. If you would like your own PDF version to download you can click HERE. Full details of all these venues including opening times, links and artists will be up on the venues page by Wednesday 10th April. News of a special pop-up family friends workshop to follow too! Till then here is a sneak preview. 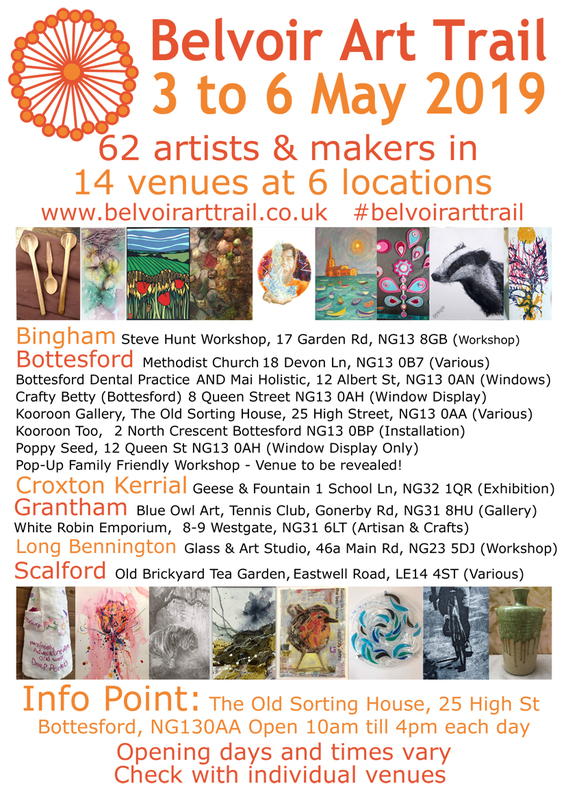 We're so excited to say that the Belvoir Art Trail, which is now in it's 3rd year has once again seen a significant growth. We see the return of some artists and venues and are joined by many more totaling 62 artists and makers at 14 venues. The trail will run from Grantham to Bottesford to Bingham up to Scalford, along to Croxton Kerrial and out to Long Bennington too! The full programme will be up on the website next week and we'll be featuring venues and artists on the Facebook page in the lead up to the event itself. If you haven't already, like the page to make sure you receive updates and look out for #belvoirarttrail across social media.